Register now for 2019 5k! The I Am A Father Race began in Atlanta, GA in 2015. 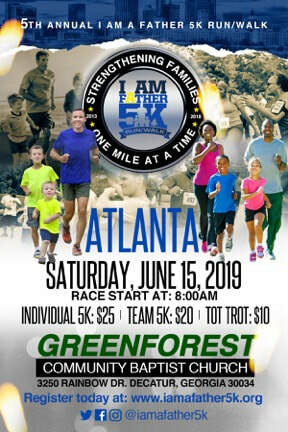 The manifestation of David Manuel and his vision for restoring everything positive about Fatherhood the 5K has become a part of the synergy to strengthen families one mile at a time. Through our 5K we are able to provide funding, support, volunteers and more to hand-selected organizations throughout the metro Atlanta area which helps our youth and show them the power of male involvement. The I am a Father 5K Run/Walk is an annual event for the entire family, celebrating fathers. Held on the Saturday before Father’s Day in Atlanta, the event promotes a holistic approach to integrating new health preventatives, physical fitness, organ donation and community bonding. It includes not only a race but a health fair, live entertainment, celebrity participation, and a fun-filled warm-up with Stepp Stewart, fitness expert from the Dr. Oz Show.